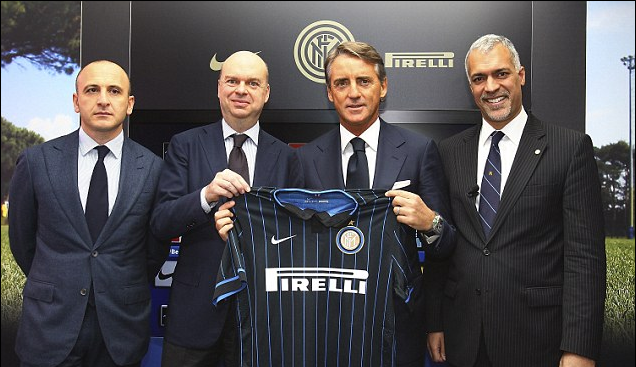 Inter Milan’s appointment of Roberto Mancini could not have been more timely. As they welcome him back with open arms, Mancini expressed delight at returning to the club with which he had had some major success with. 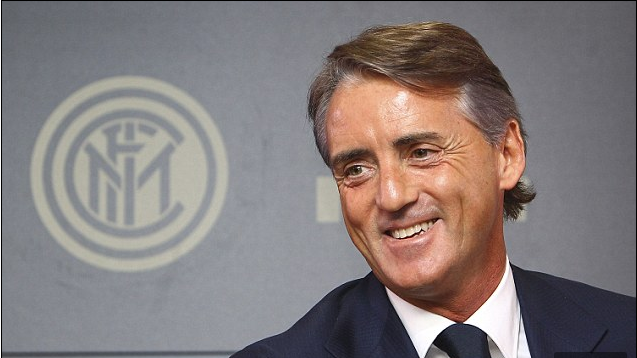 Although he hasn’t thought of ever returning to Inter, the Daily Mail quotes Mancini saying “I never thought I would return…but I think it can be another nice story”. That shows you that Mancini is confident in bringing back the good old times he had with Inter before he left for Manchester City, where he has also enjoyed success. With a team boasting the likes of Nemanja Vidic, Gary Medel, Mauro Icardi and Rodrigo Palacio, Mancini will surely benefit from having a squad of this calibre. However, some parallels arise when comparing the situation of Manchester City and Inter Milan right before Mancini joined either of them. The quality of the Inter squad is similar to the one Mancini inherited when he joined Man. City. Perhaps unsurprisingly, Mancini has already made plans to bring in some players, especially from the Premier League with Spurs’ Erik Lamela, Liverpool’s Fabio Borini, Arsenal’s Joel Campbell and City’s Aleksandar Kolarov, according to the Daily Mirror. Sure, those players can make an impact if they join. But first, Mancini has a repairing job to do in the league. A series of poor results have left Inter in 9th place, despite doing considerably well in the Europa League and taking the lead in their group. But if the results continue the way they are, Inter will miss out on European competition. The damage done by Walter Mazzari has left Inter President, Erick Thohir, no choice but to sack Mazzari after a 2-2 draw against Hellas Verona, where Inter conceded the equalizer when they were up 2-1 by the 89th minute, despite Thohir giving support to the under-fire manager a few matches before the Verona game. Strangely though, Mark Hughes was also under-fire when he was at Manchester City in December 2009 when he failed to meet expectations and was promptly sacked after an inconsistent series of results, even with a considerable quality squad in his hands. In both cases, Mancini was hired to help turn around the clubs’ misfortunes and he managed to do that when he was at City, although he just narrowly missed out on the Champions’ League places when they finished 5th. Now, Inter is hoping that Mancini can do the same with them. It is a good move, too. After all, Mancini’s CV speaks for itself. Having won three Series A titles in a row with Inter in his first spell, (although, one of them was gained after Juventus was stripped of the title due to a match-fixing scandal) along with two Coppa Italia titles, an FA Cup and a Premier League title, Inter also hopes that Mancini can restore the glory Inter once had. Although there are questions over how he does on the continental stage, right now it’s the domestic form that is the top priority for Mancini to improve. Not only that, Mancini also does have a tendency for getting pressure off the team using the media. It worked when City looked to have lost the title race in the 2011-12 season by saying that they have conceded the title to deadly neighbors Man. United and in the end won the title. And who knows? It may well work on Inter too. He also has a reputation for building a strong defense line wherever he goes. He only conceded 26 goals all season in the 2007-08 season with Inter and also gave City a reputation for having an organized defence too, with the team only conceding 33 goals and 18 clean sheets in Mancini’s first full season (2010-2011) in the Premier League. Unlike the time when he joined City, Mancini has plenty of time to prove to Thohir that he is the right man for the job and get Inter higher on the table. After all, they have experienced Mancini at the helm before. Perhaps fittingly, Mancini’s first match back at Inter will be against their rivals, AC Milan, who are only one point ahead of Inter, on the 23rd. Victory over them will surely give Mancini and his players a huge boost of confidence that can spur them up for the rest of the season. Tags: AC Milan, arsenal, Champions League, Europa League, Inter Milan, manchester city, Premier League, Roberto Mancini, Verona. Bookmark the permalink.